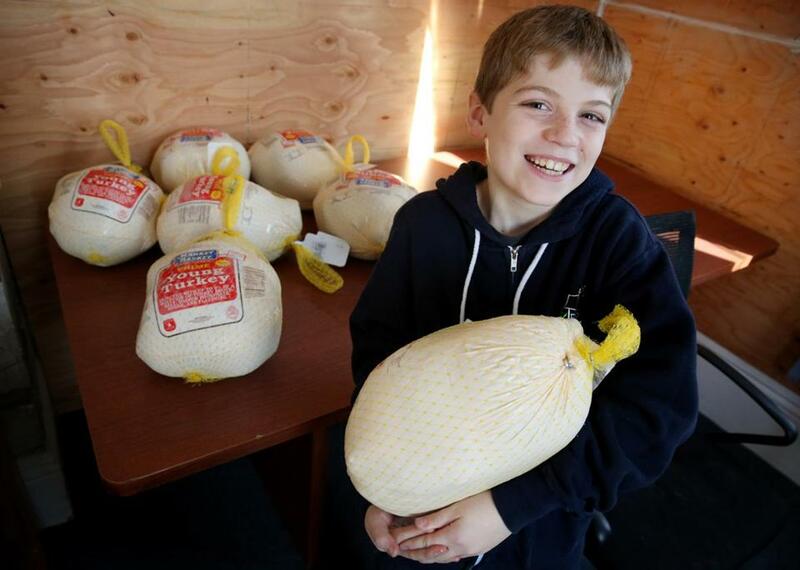 Liam Hannon, 10, with the turkeys he delivered to a Hildebrand Family Self-Help Center congregate family shelter in Cambridge on Tuesday. A sandwich won’t solve everything. But for someone living on the street, a homemade bag lunch is a welcome bit of kindness. For the past five months, 10-year-old Liam Hannon has passed out handmade lunches from a green wagon he pulls around Cambridge, alongside his dad, Scott. They call the endeavor Liam’s Lunches of Love, and since the first week of July, the duo has prepared and delivered between 700 and 800 free bagged lunches, usually on Sunday mornings, to people experiencing homelessness in Cambridge. There’s a peanut butter and jelly sandwich, a piece of fruit, a snack such as granola, and a bottle of water. An avid reader (the Percy Jackson and Harry Potter series are among his favorites), Liam is always busy. He loves to sing and dance. He created a magazine, The Pokemon Times. He swims, boxes, and plays computer games. The Hannons’ apartment overlooks Central Square, and Liam, like most kids growing up in a busy city, sees people panhandling, some not far from the building where he lives. One day, he got up the nerve to approach the strangers in need, with his father at his side, and gave out 20 meals he’d hand-packed. Liam delivered turkeys with his father, Scott Hannon (right) and Hildebrand Family Self-Help Center staff. Son and father now know their regulars by name. Their wagon route around Central and Harvard squares adjusts depending on where people are congregating. They have vegetarian offerings and make lunches for people with peanut allergies. Together, they’ve prepared spicy stews and vegetable dishes, but their staple is a homemade PB&J. Scott said they began by spending a few hundred dollars of their own money. Now they’ve set up a gofundme.com account and go to local food banks to pick up needed supplies. 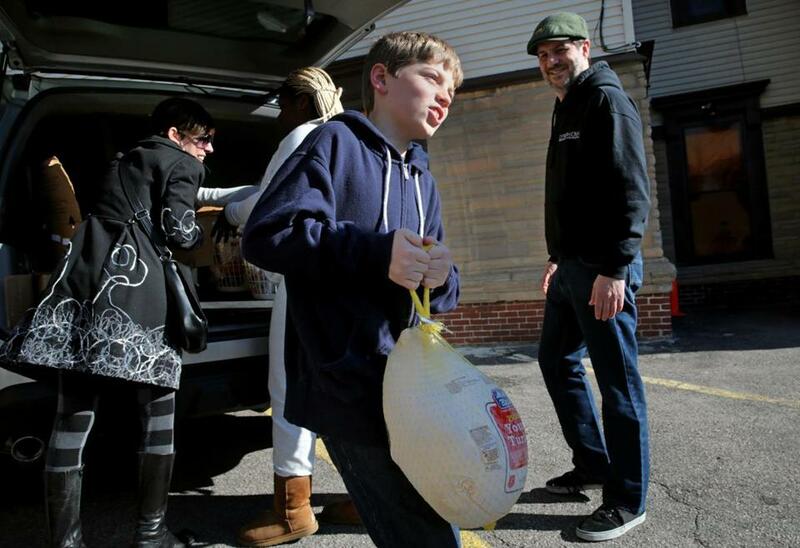 On Tuesday, Liam and his dad worked with Hildebrand Family Self-Help Center in Cambridge to deliver Thanksgiving meals to homeless families in the area. At the beginning of the school year, father and son partnered with Hildebrand to provide backpacks filled with school supplies for 400 homeless kids in shelters around Massachusetts. 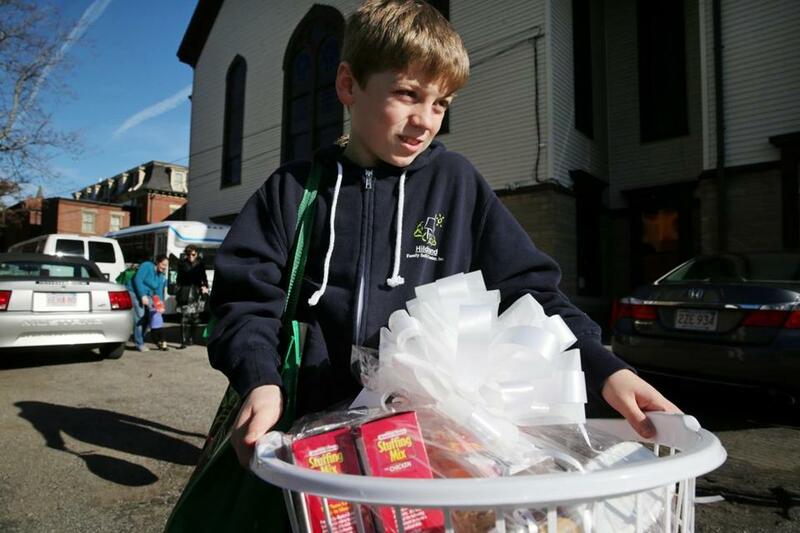 Liam delivered Thanksgiving fixings to the shelter Tuesday. Liam has never relished getting attention for his community service. When stories about his work began to circulate in the media, the little boy felt awkwardabout it. “This isn’t why I did it,” he told his father one day. In Cambridge, some of those in need now know Liam by name. Liam is often greeted as a friend with a “hello,” a smile, or in the case of one man, a secret handshake that some Red Sox players do after a big win. At some point, Liam wants to start a nonprofit. He also wants to be an animal rescuer. His father remembers Liam’s first rescue: a bucket of 15 baitfish. Father and son had gone fishing. Liam watched his dad jab one small fish with a fishing hook. The boy held the bucket against his chest. “I heard him tell the fish, ‘Don’t worry. It’s OK. I’m going to talk to him,’ ” Scott said. “He’s just a wise soul for his age,” Scott said.